I have an Ext4 partition (not auto-mounted) that I would like to share (entirely) in my home that contains Mac OSX, Windows and Linux machines (currently the most important is sharing with the Mac). How may I do this? 1 - workgroup - you'll want to set that to the name of your network workgroup, if you have one. 2 - security = user - even if this line is commented-out, user-level security is the default for Samba. 3 - Define your Samba share at the bottom of the file. You should see a (commented-out) example at the bottom. You'll need the mount point of your ext4 partition (that you want to share). If you're not sure of what that is, do a "df -k" from terminal, and you should see it (put it in the "path" setting instead of "/some/directory"). 4 - Next, you'll need to alter the permissions on the path (mount point) to ensure that the desired users can accomplish what they need to. When you go to the Connect to Server dialog, you may browse the names of computers that are on your local subnet. Navigate in Nautilus (the file browser) to the mount point of the drive you want to share (e.g., /media/MyDrive). Go up to the parent directory (in this example, /media). Right-click on the drive name (MyDrive), and click Sharing Options. As you can see, enabling guest access is as simple as checking the box for it. 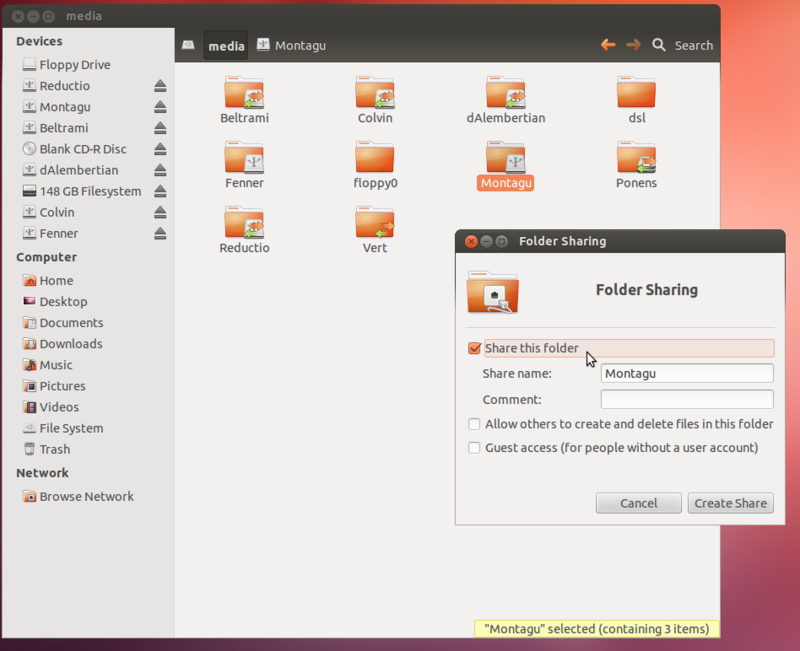 Nautilus might tell you that you have to install some packages to share a folder. This will happen if Samba and its dependencies are not already installed. You can say yes to this. After installation, you may have to log out and back in (rebooting also works but is not necessary). Then go back to Sharing Options. Now that the necessary packages are installed, you can share the folder. This method works for sharing statically mounted volumes (like yours), dynamically mounted volumes, or any folder. Not the answer you're looking for? Browse other questions tagged samba ext4 shared-folders or ask your own question. How to setup an Ubuntu Server? How to fix Samba read and write permissions for directories in an ext4 partition? How do I share a folder with another Linux machine on the same home network? How do I share a folder on a NTFS partition over the network?